E-voting protocols aim at achieving a wide range of sophisticated security properties and, consequently, commonly employ advanced cryptographic primitives. This makes their design as well as rigorous analysis quite challenging. As a matter of fact, existing automated analysis techniques, which are mostly based on automated theorem provers, are inadequate to deal with commonly used cryptographic primitives, such as homomorphic encryption and mix-nets, as well as some fundamental security properties, such as verifiability. 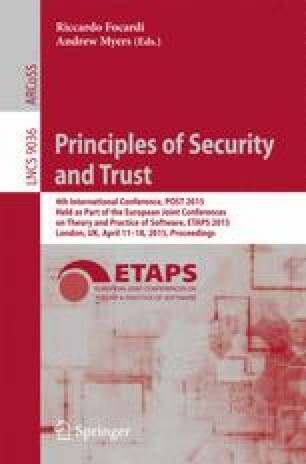 This work presents a novel approach based on refinement type systems for the automated analysis of e-voting protocols. Specifically, we design a generically applicable logical theory which, based on pre- and post-conditions for security-critical code, captures and guides the type-checker towards the verification of two fundamental properties of e-voting protocols, namely, vote privacy and verifiability. We further develop a code-based cryptographic abstraction of the cryptographic primitives commonly used in e-voting protocols, showing how to make the underlying algebraic properties accessible to automated verification through logical refinements. Finally, we demonstrate the effectiveness of our approach by developing the first automated analysis of Helios, a popular web-based e-voting protocol, using an off-the-shelf type-checker.